The magic always works at Anna's House Bed and Breakfast, a Luxury B&B in Newtownards, Northern Ireland in the United Kingdom. As you relax with a warm cup and look out over the most tranquil lake and meadows, happy to have arrived at Anna's House Bed and Breakfast. The hospitality is superb and the delicious organic breakfasts are a revelation. Many independent publications including the Sunday Times, Irish Times and a host of others recommend Anna's House as one of the very best places to stay in Britain and Northern Ireland. 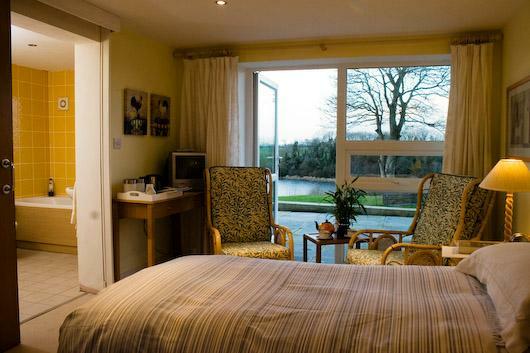 Anna's House Bed and Breakfast's rooms feature en-suite bathrooms, the finest Irish linen sheets, and WiFi internet. We are committed to positive action in reducing our impact on the environment, using organic produce as our standard at Anna's House Bed and Breakfast in Newtownards. Green Suite - Relax in the luxury of the finest pure Irish linen sheets and wake to a view across Lough Tullynagee with its surrounding woods and meadows. This original room of our nineteenth century farmhouse has an extensive private sitting room, balcony, vaulted pine ceiling, and en-suite bathroom. Simply wonderful. 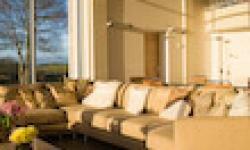 Blue Suite - enjoy our massage chair as you survey the panorama of lough and rolling drumlins from your own private lounge. Then take a relaxing dip in the en-suite bathroom before curling up in the finest pure Irish linen sheets: simply blissful! Wheelchair Access - Accessed from the ground floor and a featuring a large open wet room this room is wheelchair friendly, as are our music and dining rooms. Twin Bedroom - The room is located on the ground floor, featuring French doors opening onto a private terrace and a large wet room. The twin room has two single beds with the finest pure Irish linen sheets. As you enter the Music Room, you will stop to look up to the apex 30 feet above and through the panoramic windows across the meadows, lake and far mountains. The room has such an aura of tranquillity that many of our guests regard us as an ideal retreat. The Yellow Bedroom offers a quiet space to relax and unwind while observing the wide variety of species coming to feed at our bird table. 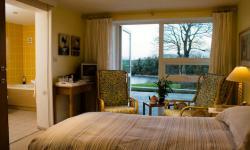 This room has a double bed with the finest pure Irish linen sheets. The en-suite bathroom is equiped with a welcoming and generous power shower. We host parties in the Music Room when the house is taken over by family and friends; the room becomes a perfect party space, completely private and so beautiful that newcomers are completely astounded. This space also lends itself perfectly to groups who wish to get away from it all, be it for painting, yoga, birdwatching or indeed for business people looking for a secret space for some blue sky thinking. If you have the space in your luggage, do bring your musical instrument. An organist from Westminster Abbey sat down at our Yamaha grand piano one evening; hearing him play Bach was unforgeable.